In my initial hands-on review of this innovative product, I concluded that ‘I think this is going to be exactly what I’ve been looking for’. After using it in the field, I’ve changed my mind. Here’s why. What and who is this thing for, again? It’s a metal base plate designed to accept three trekking poles, or two trekking poles and an accessory leg, forming a makeshift tripod. It has a ballhead for accurate positioning of the camera. 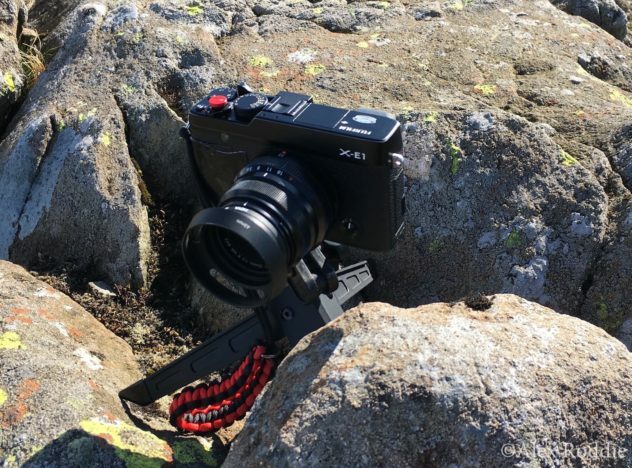 It can hold a surprising weight of kit – say, a large mirrorless camera or small DSLR. The device weighs 233g (excluding trekking poles). It’s specifically designed for ultralight backpackers who require a full-height camera support. I took the Trailpix to the Lake District a couple of weeks ago and put it to work, shooting images for editorial use. Unfortunately, it didn’t perform as well as I anticipated. There is no convenient way of carrying this thing. I ended up keeping the accessory leg in a side pocket, but the Trailpix itself – although small – has a surprisingly awkward shape, and it didn’t really fit anywhere I tried to put it. The sharp tightening screws dug into my leg when I tried keeping it in a pocket, and this made me think twice about storing it in my rucksack hip-belt pockets too (ultralight fabric doesn’t like abrasion). The ballhead came unscrewed several times. This is because the mounting screw is not permanently attached to the Trailpix base plate. It easily comes unscrewed and then falls off. Actually deploying the tripod is a fiddly affair. Because it has to be assembled from multiple components, I lost count of the number of times the trekking poles fell over before I had a chance to tighten the screws, or the accessory leg slid out of its mount – this was particularly annoying, and happened virtually every time I tried to deploy the tripod. I think it’s because the end of the accessory leg is smooth, so there’s nothing for the tightening screw to grip. I can’t imagine how fiddly deployment would be in winter conditions, wearing gloves. The assembled tripod is only stable in calm conditions. It was very windy for two days, and I had to weight the whole thing down with a loaded camera bag to have any chance of decent performance whatsoever. Even then, it very nearly blew over more than once. In the end I abandoned my attempts to use the Trailpix and reverted to my ankle-height Ultrapod instead (weighted down with rocks). 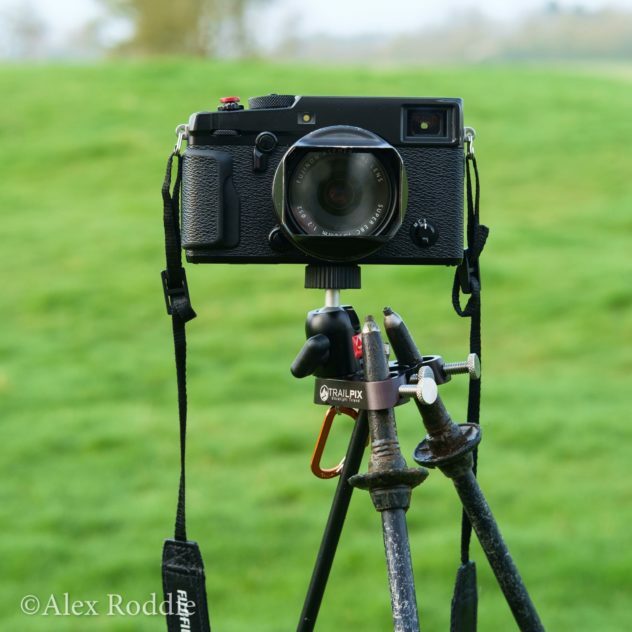 While any lightweight tripod will struggle in high winds, the Trailpix failed to meet my modest expectations. It was just loose, wobbly, and felt a bit like playing Russian Roulette with my expensive Fuji gear. 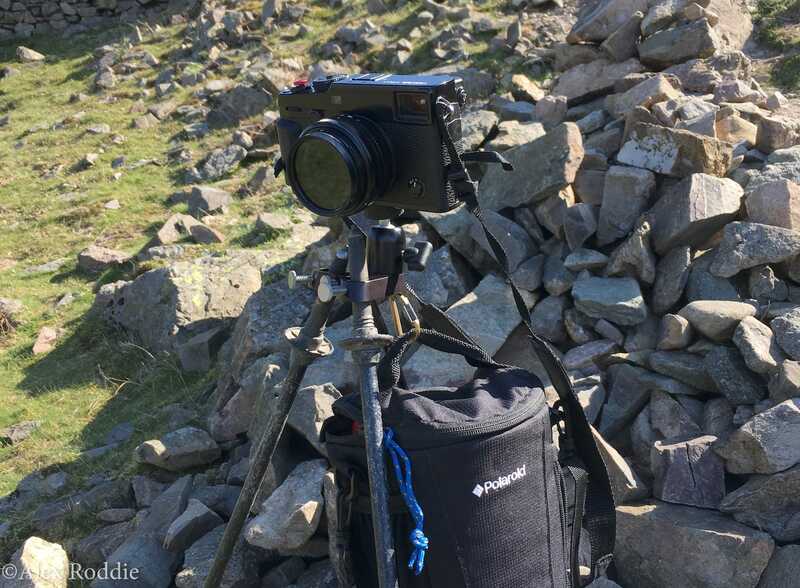 It can certainly hold the weight of a 660g+ camera just fine – in calm conditions – but the moment you put wind into the equation it becomes unmanageable. This would be true for any camera. It felt unstable even supporting my iPhone. The faff factor is also considerable. I think the Trailpix can be recommended as a bare-bones option for basic, occasional use in near-calm conditions. But if you are looking for a complete tripod solution, look elsewhere. You will need to carry much more weight than this to get a stable and frustration-free camera platform. It’s a shame, because the concept is innovative and a great example of multi-use, ultralight backpacking gear. If your requirements are simple then it may just be enough, but I think most photographers’ needs will exceed the capabilities of the Trailpix. Full disclosure: I purchased this item with my own funds and have no relationship with the manufacturer.